Home » Austria » How to migrate to Austria under Austria Red White Red Card ? Austria immigration is opted by number of overseas individuals as the country is offering excellent career opportunities. Austria has launched a flexible immigration program referred as Austria Red White Red card. The aim behind the initiation of Austria RWR card is to ease the immigration process for foreign employees and their families who wish to migrate to Austria in order to obtain Austria Permanent residency depending on the individuals’ personal and labor-market associated criteria. The Austria Immigration rules under this program came in to effect from 1 July 2011. 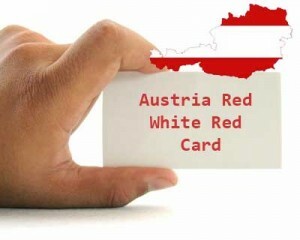 The Austria Red White Red card holder can sponsor their family members to join them in the country. Here, the family members include partners or spouses, registered partners, unmarried children under 18 years of age including step and adoptive children. Overseas citizens who wish to take up job in Austria under Austria Red White Red Card must meet the following requirements. Applicants need to qualify in the points test by securing a minimum pass points. These are the basic requirements an applicant need to fulfill for Austria immigration. However, apart from these basic requirements there exist other Austria RWR card requirements for each eligible person. Austria Red White Red card is a point based system, where an individual need to score a minimum points in order to migrate to Austria. The points are awarded based on the personal and professional parameters or aspects of the individual such as age, work experience, language skills, employment offer and qualification. The points for each aspect differ and its eligibility is calculated differently. For Extremely highly qualified employees minimum pass points are 70, for skilled employees in shortage professions and other key employees minimum points required is 50 and for self-employed key employees and for students or graduates there exists no points based system. People who wants to migrate to Austria, Please fill out MoreVisas Enquiry Form , and also Follow Us @ Google+, Facebook, LinkedIn.